Conjunctivitis is by no means limited only to children. An infection or inflammation of the conjunctiva — the membrane within the eyelid and protecting the white aspect of our eyes — can occur in individuals of any age secondary to an infection, an allergic reaction or chemical irritation. Infectious conjunctivitis can be the result of a bacterial or viral infection. In children, however, a highly contagious type of bacterial conjunctivitis can often run throughout a school or daycare facility’s entire population due to the isolated subpopulation of children available as victims and habits children engage in throughout the day. According to an interview with Dr. Laura Perrin of the New Jersey Society of Optometric Physicians, children are often prohibited from attending school until they have been treated with antibacterial eye drops or ointments for at least 24 hours in an effort to help prevent the infection of an entire school. 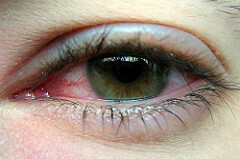 • “Pink Eye” is the common name for the eye infection known medically as infectious conjunctivitis. • Germs or bacteria cause most infectious conjunctivitis. Treatment requires antibacterial eye drops or eye ointment to help your body’s defenses fight the infection. • Viral or infectious conjunctivitis can be spread by touch, both direct and indirect. Teach your child never to intentionally touch another child’s face or eye area. If this occurs accidentally, your child should wash his or her hands immediately or use an antibacterial gel. • Teach your child the advanced symptoms of pink eye, such as matted eyelashes, pain with each eye blink and discolored sclera or whites of their eyes. Remove the child’s pillowcase and any washcloths or towels used to be laundered so as not to spread the infection among family members. If you suspect that your child is developing infectious conjunctivitis, make an appointment with your family optometrist immediately. An optometry examination can help determine if the inflammation is viral or bacterial and what treatments and medications will be necessary to avoid the spread of the disease.